The man now honoured as Venerable Francis Mary Jordan was born in Gurtweil, Germany, on June 16, 1848. On the following day he was baptized at the local parish church with the name John Baptist. 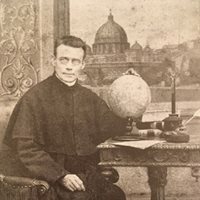 Being brought up in a poor family, he was not able to realize his dream of becoming a priest, although as a teenager he had already become aware of his vocation at the moment of his First Communion. After finishing primary school he worked as a journeyman and painter-decorator, traveling throughout Germany. John Baptist noticed the difficult spiritual situation of his homeland and of the other European countries, as people abandoned the practice of their faith. The Church in Germany was limited in performing its mission by the state (Kulturkampf). All these experiences strengthened Jordan’s faith and conviction that he was called to be a priest. In 1869, he finally resolved to pursue his vocation and began his formal studies. Despite being older than his classmates, John Baptist worked hard and discovered a gift for languages; for the graduation exam he presented an essay in eight European languages and another one in four other languages. Finally, in 1874 John Baptist began his studies of theology and philosophy. He used these years of study to deepen his faith and spirituality. He continued receiving the sacraments regularly, which had been his usual practice since childhood, and he devoted much time to prayer. He also began his lifelong practice of writing his Spiritual Diary, in which he recorded texts that inspired him and the prayers of his heart. In the years since his death, this diary has become an invaluable source of knowledge for his personality and spirituality.